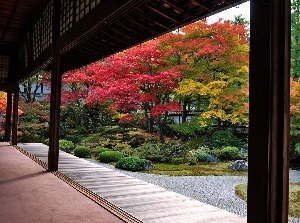 Sennyuji is a temple of Shingon Buddhism, a major school of Japanese Buddhism, and is the central temple of a branch school of Shingon Buddhism. 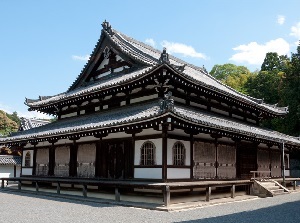 It is located about 0.8 km east of Tofukuji temple. It is said that this temple was founded around 856. But there are several theories about the origin of this temple. 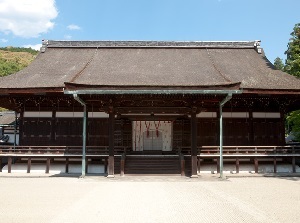 The temple had fallen into ruin, but high priest Shunjo reestablished it in the early 13th century. Shunjo had studied in Sung (current China) for 13 years, and he introduced the advanced culture to Japan. He remade the temple in Sung style. The temple developed after that, and Emperor Go-Horikawa set this temple as the Emperor Family temple. So the emperors from Emperor Go-Mizunoo (1596-1680, the 108th) to Emperor Komei (1831-1867, the 121th) were buried in this temple. Along the hundreds-meter-long approach, there are some branch temples. 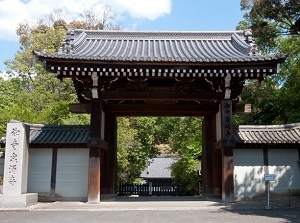 And at the end of the approach, there is Daimon gate built in the early 17th century. After passing through the gate, we find Yokihi-Kannondo temple to our left. "Yokihi" is the pronunciation of word in Japanese, and it is formally "Yang Guifei" which is the name of a very beautiful Chinese empress in the 8th century. 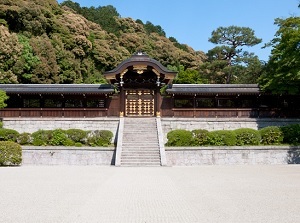 In this temple, a statue of the Goddess of Kannon has been enshrined. In 1230, priest Tankai who was a disciple of Shunjo took the statue back to Japan from Southern Sung. It has a fair and noble face, so it made the legend that Emperor Xuanzong of Tang got this statue made for in honor of the soul of his dead wife Yang Guifei. So the name of this temple has "Yokihi" (Yang Guifei). Surely, this statue is someting totally different from the other Japanese Buddha statues. And there are main buildings of Sennyuji. 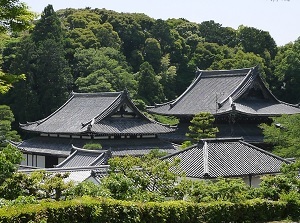 Butsuden is the central temple built in 1668. Shariden is the important temple, and has housed the Buddha's ashes presented by Sung in 1228. 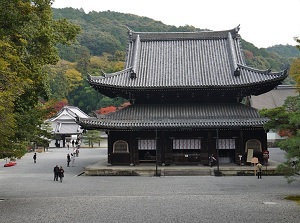 Reimeiden is the temple housing the sprit tablets of all emperors and empresses since the 7th century. It was destoyed by fire in 1882, then Emperor Meiji rebuilt in 1884. Gozasho next to Reimeiden is the rest house for Imperial Family, and was the building moved from Kyoto Imperial Palace and rebuilt in 1884. It has a Japanese garden. 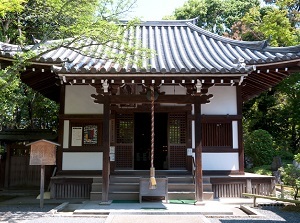 Kaiedo attaching to Gozasho is the Buddhist temple, and houses more than 20 Buddha statues for former Imperial Families. To the east of these buildings, there is Tsukinowa-misagi. It is the cemetery buried tens of Emperors and Imperial Family in the 17-19th centuries. But it is unexpectedly modest and not so large, although it is the imperial cemetery. The admission fee is 500 yen. But we cannot enter into Tsukinowa-misagi. And we must pay 300 yen as a special fee to visit Gozasho and Kaiedo. By route bus with route No. 208, about 11 minutes from Kyoto station to Sennyuji-michi stop. By route bus with route No. 202 or 207, about 9 minutes from Gion to Sennyuji-michi stop. By JR Nara Line, about 3 minutes from Kyoto station to Tofukuji station (next station). About 10 minutes walk from there. There is the station of Keihan Line by JR station. Only local train stops here.